I found a new site today to add to the Beautifying Your Home Collection. It seems they are rather popular; but they are new to me. I love to find new things. New things make me happy. 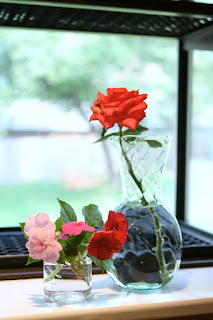 A new pretty blog is free. Free stuff makes me happy too. 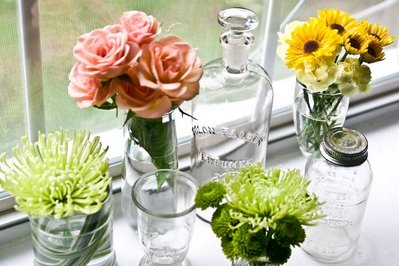 The site is The Lettered Cottage; and I found a post about small glass vases and fresh flowers. I love both. I am inspired to do something new and creative with the window box over my kitchen sink and now I think I know just the thing. Not too bad for what I had on hand...the little one is a baby food jar. Bonus: If you look past the flowers you can see my little persimmon perch!